In this section we will understand the Spring MVC Module in detail. In this we will see the request flow for the spring framework. We will also show you the request flow diagram illustrating the working of Spring MVC module. The Spring MVC modules comes with the Spring Framework distribution. The Spring MVC modules of the Spring Framework well integrates with rest of the framework. This modules is also very extensible. Spring MVC is based on the MVC design pattern. Here is the list of key classes of Spring MVC. The DispatcherServlet is configured in the web.xml file and required URL patterns are mapped to this Servlet. It works as the front controller and handle all the request from the user. 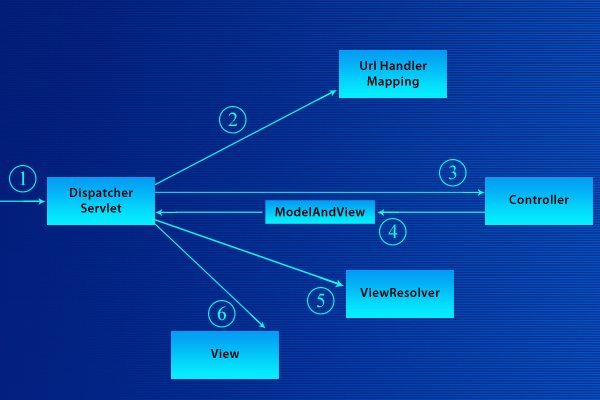 This class works as the holder for both Model and View in the Spring MVC. The SimpleFormController is the Concrete FormController implementation. It provides the configurable form and success views, and an onSubmit chain for convenient overriding. Automatically resubmits to the form view in case of validation errors, and renders the success view in case of a valid submission. The DispatcherServlet configured in web.xml file receives the request. The DispatcherServlet finds the appropriate Controller with the help of HandlerMapping and then invokes associated Controller. Then the Controller executes the logic business logic (if written by the programmer) and then returns ModeAndView object to the DispatcherServlet. The DispatcherServlet determines the view from the ModelAndView object. Then the DispatcherServlet passes the model object to the View. The View is rendered and the Dispatcher Servlet sends the output to the Servlet container. Finally Servlet Container sends the result back to the user. Spring MVC is request driven and DispatcherServlet handles the request from client and then dispatches the request to controllers. It tightly integrates with the Spring IoC container and allows the developers to use every features of Spring framework. 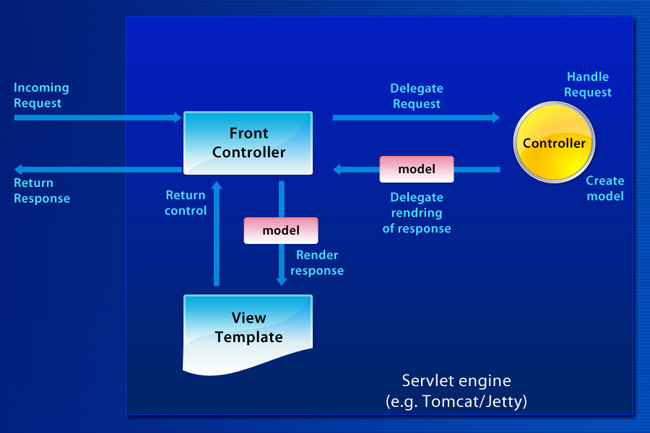 The following diagram illustrates the request flow in Spring MVC. Client access some URL on the server. The Spring Front Controller (DispatcherServlet) intercepts the Request. After receiving the request it finds the appropriate Handler Mappings. The Handle Mappings maps the client request to appropriate Controller. In this process framework reads the configuration information from the configuration file or from the annotated controller list. Then DispatcherServlet dispatch the request to the appropriate Controller. The Handler Adapters involves in this process. Then the Controller processes the Client Request, it executes the logic defined in the Controller method and finally returns the ModelAndView object back to the Front Controller. Based on the values in the ModelAndView Controller resolves the actual view, which can be JSP, Velocity, FreeMaker, Jasper or any other configured view resolver. Then the selected view is rendered and output is generated in the form of HttpServletResponse. Finally Controller sends the response to the Servlet container, which sends the output to the user.